Yesterday I attended a day organised by Changing Attitude, a group for LGBTI people within the Anglican Church. I had been invited to bring along some of my paintings and to make some art at the venue throughout the day. The crowd at the conference were a delight to be with; warm, charismatic and courageous. It was energising to share the room with such a diverse group. It’s always a creative adventure, going to an unknown place, with unknown people and setting up my easel to do something creative. If showing a finished piece of work in public is exposing then actually creating a work in public is even more so. When people squint and look puzzled at the early sketches and wonky lines that will disappear before the piece is finished I have to resist the temptation to justify what I’m doing and try to describe the vision of the piece that I have in my head. Better just to wait, bide my time and push on through the clumsy and ugly initial stages of a piece of work that are usually concealed in the solitude of the studio. I arrived with my blank sheet of paper without any idea of what image I was going to create, sitting as inconspicuously as possible, I waited. It’s taken a while but I’ve learned by now to trust in the process of waiting. I waited in the space, a beautiful Victorian Church in Stockport UK, watching, listening and absorbing the feel of the place and the group of people gathered there. In his 2013 Reith lectures Grayson Perry quoted a young girl who, when asked what she thought artists did replied “They notice things”. It was only at the end, when I stepped back to look at what I’d done that I began to reflect on the meaning of the picture. What started as a study of a very material and ordinary thing, the shadows in hanging fabric, became an image laden with significance. I used to prepare for events like this with ideas, and sketches beforehand as a safe anchor to cling to, but no more. I’m reminded of what Jesus said to his friends when he told them not to worry about what to say because the Spirit would give them the words. It seems to me that if we wish to live creatively, in any sense of that word, then each moment holds all that we need. So, as I waited with eyes and ears open and a blank sheet of paper in that vibrant space everything that I needed was there for me. Each breath, each sound, each image on our retina contains the potential of the whole universe. Looking at the piece now it feels to me as if it reflects so much of the strength, warmth, dignity and courage I experienced in that place and with that community. 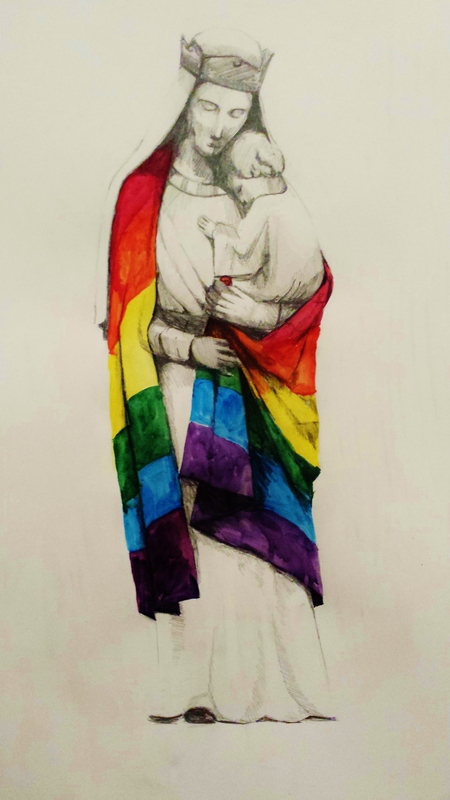 So I offer the image as a prayer for my LGBTI brothers and sisters in the Anglican Church.